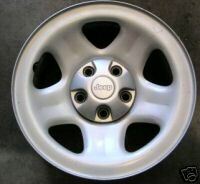 i have 5 factory 06 jeep steel wheels. they are 15 by 7 and one has a new tire on it. if they need to be shipped buyer pays shipping.